Hawaiian Alison Teal took her surfboard 40 metres underground to surf the Catacombs of Paris to highlight the importance of keeping our waterways clean for future generations. At times she had to crawl through the passageways and then, on her surfboard, Alison paddled in the water under the city. It was shocking that there was a maze of over 6 million skeletons beneath the city. Alison was in France to promote the cleaning up our oceans and freshwater sources. She also gave a speech at the Environmental World Forum while she was there. 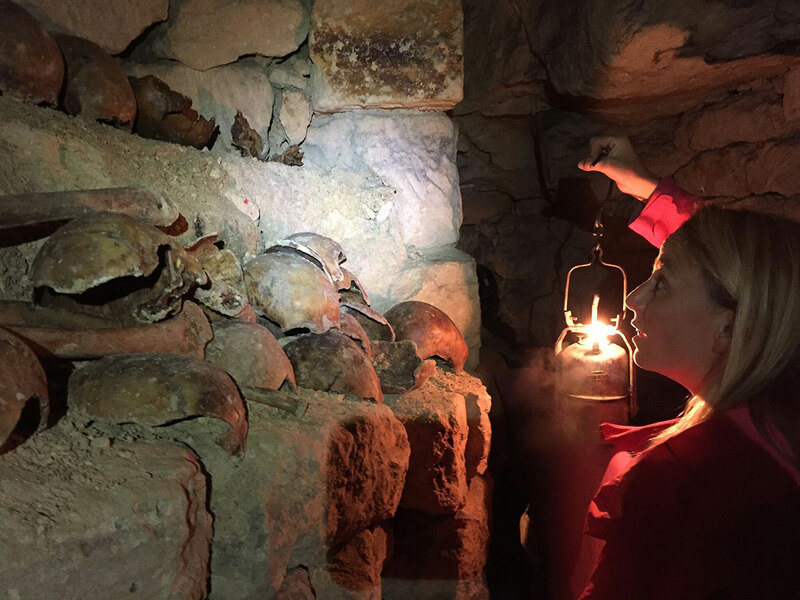 To highlight the issues Alison took the eerie pictures in the Catacombs and also paddled around some more scenic spots including the river Seine in the shadow of the Eiffel Tower. The Catacombs are a series of mines and ossuaries below the city stretching over 200 miles and containing the bodies of over six million displaced skeletons from cave ins and overflowing cemeteries. After capturing the shots, Alison and her support team were shocked to discover the water level had risen. “Skulls lined the walls and it smelled horrid. As soon as someone turned a corner, you had no idea where they went.” She added. This isn’t Alison’s first brush with danger and you may even recognise that pink board and bikini from a dicey deal when she surfed the erupting Kilauea Volcano in Hawaii.